Mark Tyler played well for Posh at Lincoln. 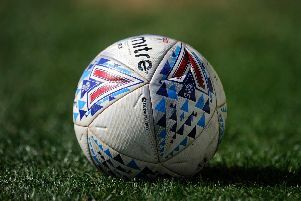 Peterborough United threw away a two-goal half-time lead in a friendly at Sincil Bank tonight (July 26). Indeed it took a fine penalty save from veteran goalkeeper Mark Tyler to stop National League side Lincoln from winning a keenly-fought contest. An entertaining match instead finished 2-2. Adil Nabi scored for Posh at Lincoln. This was effectively the Posh second string - one that included rock-solid Micheal Bostwick and expensive purchase Tom Nichols - but some players showed enough in flashes to suggest they could yet challenge for a starting place when the season starts for real on August 6. Certainly Adil Nabi showed some neat touches in midfield, while Nichols was a lively presence up front. Tyler simply confirmed his standards remain high even at the age of 39. Nabi shot Posh ahead with the aid of a deflection in the 18th minute and a fine burst into the area by Nichols, and a precision pass, enabled Jordan Nicholson to make it 2-0 just before the interval. Nichols had forced a decent save from home ‘keeper Paul Farman just before the goal. Jordan Nicholson scored for Posh at Lincoln. But Jamie McCombe pulled a goal back for Lincoln three minutes into the second-half following a corner before Tyler was forced to preserve the lead with a fine save from a Matt Rhead spot-kick struck low to his left. But relief was short-lived as Lincoln found an equaliser 20 minutes from time through Jack Muldoon. Muldoon had earlier been thwarted by a brilliant Tyler save, while Rhead headed against the bar in the first-half. Posh: Tyler, White, Nicholson (sub Piesse), Nabi, Bostwick, Cartwright, H. Anderson, Chettle, Nichols, Stevens (sub Penfold), Williams. Substitutes: Elsom, Baldry, Alban-Jones. Lincoln: Farman, Wood, Beevers, Waterfall, McCombe, Muldoon, Woodyard, Power, Miles, Simmons, Rhead. Substitutes: Habergham, Walton, Howe, Hodge, Stanley, Acar, Marriott. Goals; Posh - Nabi (18 mins), Nicholson (41 mins). Lincoln - McCombe (47 mins), Muldoon (70 mins).